About the Expert College Football Selections from Bankroll Sports which are the Very Best in the Sports Betting Industry! See for Yourself Today! Do you often find yourself fall Saturday evening feeling dejected from losing so many bets in the afternoon, all while you're chasing your loses from earlier in the day. After that, you begin to chase even more, by placing even larger wagers on the late night Pac 10 college football matchups. You even start thinking about chasing even more with the NFL on Sunday? If this sound familiar; if you are frequently going through a Saturday of college football betting and struggling regularly; if you often find yourself chasing each of your losses....then you need to read more about our expert services and consider getting some help from real handicapping professionals. If you have ever been in a situation where you're chasing your losses, you're not alone. This hopeless feeling is completely common amongst average and "public" sports bettors. In fact, 60-70% of the college football betting public feels exact same way every Saturday at the end of the day; even after waking up with the feeling that they can take on the world. Most bettors will wake up, place five or six college football bets in the morning, and will then sit back & watch the card fail. After that, it's all downhill for the rest of day as they begin to make more undisciplined college football selections and begin to double and triple their wagers in the evening. It's a horrible cycle that needs to be broken if you want to have success. It all starts with the picks that you are betting on. The first step is to get your college football picks from actual sports betting professionals; professionals that have access to key information and actually know how to breakdown and analyze these college football games. Aren't you tired of being suckered into a losing mentality (a mentality that most bettors have)? You should be tired of this...You should be tired of falling into the exact trap that the sportsbooks and local bookies want you to fall right into. Our expert handicapping crew knows exactly what it takes to change those losing ways and have you betting on picks that win. If you want to be a part of something where you're watching your Saturday bets win with more regularity & consistency....if you want to have your money on the type college football picks where it's a surprise when the picks lose, rather then it surprising you when your picks win....if getting college football picks that actually win with consistency is something that sounds appealing to you....Then you have come to the right place. You have found your way to one of the sharpest sports handicapping services in the entire world, a service that offers picks from true betting pros. The team of handicapping experts at Bankroll Sports knows exactly what it takes to permanently change the way that you bet on football. They will show you consistent winning like you have never seen before; and the type of winning that you never thought was possible. Right here and right now you have the opportunity to completely alter the same losing habits that 95% of all college football bettors are accustomed to. Our completely affordable service features two of the sharpest expert sports handicappers in the business. We can understand that it's very easy to be skeptical, as there are hundreds of phony services and garbage sites out there today (on the web, in the newspaper, on the radio, etc). We assure you that we are not one of those services; and all that it will take for you to see that, is to try us out for just one or two days of premium college football picks. We're not like the rest of the scam services out there today, which often includes scam artists that are trying to sell you different college football picks (some of them on the same game) from four or five different sports handicapper names that don't even exist (yes, fake people). Instead, our reputable company's premium releases come from a combined sports handicapping syndicate; where our professional sports handicappers work together in unison to provide our clients with the very best college football picks that the entire sports handicapping industry has to offer. When you purchase premium football selections from our professional handicappers, you are getting the very best there is. You are getting expert football picks that are backed by key information as well as long-time, tracked systems & strategies. You'll be betting on information & handicapping strategies that even some of the oddsmakers aren't aware of when they post the opening college football lines early in the week. Give our expert handicappers a try and start experiencing what it's like to have your money on winning picks that will prove to be sharpest plays on the board, week-in and week-out. Once you have experienced a winning week or two from our college football picks, you'll never want to use another service or bet on anyone else's picks for the rest of your life. Hop aboard the Bankroll Sports train right now. Start putting your money on the best college football picks in the world. Sign-up below you'll begin to experience what it's like when "winning" is something that is expected every single week (instead of being a luxury). Every package includes all picks in every sport! joining the Bankroll Sports free picks & email list below. You can also find other free football picks from our guest sports handicapping services and from our professional sports handicappers on our daily free sports picks page. -Before you start betting online or with your local bookie, check out the current NCAA Football Week 5 Lines from several books to get an idea of what a good line is for the particular NCAA football picks that you like and the games that you want to bet. Check out this weeks college football TV schedule and see which games will be televised regionally and nationally. -Wondering what is happening with the latest news regarding the college football teams switching conferences? Check out our writers blog article on the Super Conference Expansion and Conference Realignments. -Check out the current NCAA Football Week 4 Lines along with the college football TV schedule for week four. -Take a look at some of the week 3 NCAA football trends and matchup cheat sheet for the upcoming week's ncaa football games before making your picks this week. -Here are the latest NCAA football week 3 lines along with a breakdown of the lines and big games for the week. -Check out the latest odds to win the college football BCS National Championship where our blogger, Adam offers free picks and predictions for next season. -Our bloggers have made some BCS Predictions along with the current BCS Standings on the Bankroll Sports Picks blog. -Check out the latest college football major conference championship odds and our writers have also provided some free picks for each conference. -Need an update on what's happening in the college gridiron? Here are some of the top ncaa football headlines after week three of the 2009 college football picks season. -Check out the current Odds To Win The Heisman Trophy along with an update on the top candidates to win the big award. -Some free college football prop bet picks for opening night from one of our top sports bloggers. -Now up on the blog is our bloggers and writer's 2009 Heisman Trophy picks along with the full list of odds and a complete preview of the 2009 Heisman Race! -You don't have to search through all the search engines and browse the internet for football contests anymore. The Bankroll Sports Blog is providing a comprehensive list of all the free football contests on the web for 2009. Participate in every single free NFL and college football contest this year without missing a single one. -Our writers have released our 2009 Preseason Top 25 Rankings for the upcoming season. Take a look at our rankings to see what you think. -Our bloggers offer up some free college football over/under team wins picks for the 2009 season. Check them out on our blog. -Bankroll Sports top football columnist, Jay discusses and ranks his preseason top 10 teams & preseason top 10 running backs for the upcoming 2009 season. -Our bloggers offer some futures picks including a 2009-10 Heisman trophy prediction on the Bankroll Sports Blog! -Check out the head coaching changes in 2009 for all the major conferences. -Our bloggers start an early 2009 college football picks discussion and rank their top 5 sleeper teams of 2009 on the Bankroll Sports Handicapping Blog. -Before doing your college football betting this season, make sure that you are following these basic handicapping tips as they will lead you to becoming a more successful handicapper. -These days, it seems damn-near impossible for a college football team to go undefeated. It's seems like forever since is has last happened. The Bankroll Sports Handicapping writers take a closer look at the last ten undefeated college football teams and examines their amazing seasons in more detail. They also rank and examine the top 10 national championship teams. -Interested in betting the on the Heisman Trophy award this year? Our writers and handicapping crew discuss the 2008 Heisman Trophy ace and offer up their 2008 Heisman candidate odds & predictions breakdown. -Everyone loves an upset. Upsets are one of the greatest things about watching college football on Saturdays. Is there anything more exciting then witnessing a mid-major team take on a NCAA Division 1 powerhouse and completely shocking the national? Have a look a our columnists' rankings of the top 5 mid-major upsets in NCAA football history. -Before doing any college football betting, you should know about some of the teams with the best home field advantage as our writers rank the NCAA's top 5 home fields. Read more about the college football predictions & Bowl Picks from the handicapping experts at Bankroll Sports. Get more college football selections from Prime Sports Picks. -Here are a variety of entertaining and interesting NCAA football bowl game facts that you may not be aware of. -When betting on college football, you shouldn't always base your picks on betting systems & last week's results. Foot injury will sideline Nebraska player. A foot injury will sideline Nebraska Cornhuskers wide receiver Niles Paul. Paul also serves as the team's kick returner. Head coach Bo Pelini stated on Wednesday that Paul hurt his foot at practice on Tuesday. His status for the rest of the season is also in question. On the season Paul has 39 catches for 516 yards and a touchdown. He is Nebraska’s leading receiver. The Cornhuskers are preparing for their regular season finale against the Colorado Buffaloes. A win for Nebraska would seal the deal on the Big 12 North. Penn State head coach plans to return for another season. The oldest active head coach in college football plans to return for another season. Joe Paterno is set to start his 45th season as the head coach of the Penn State Nittany Lions. Paterno will be in his final year of his contract in 2011. The 84 year old picked up his 400th career win during the 2010 season. The Nittany Lions are 7-4 this season heading into their season finale against the Michigan State Spartans on Saturday. Newton, Luck and Moore finalists for Maxwell Award. Cameron Newton, Andrew Luck and Kellen Moore were all announced as finalists for the Maxwell Award on Wednesday. The Dave O’Brien award is given to the top quarterback in the country. Newton and Moore have led their teams to unbeaten record, with both seeking a berth in the national title game. Luck has been the leader of the Stanford offense. The Cardinals are looking at heading to the Rose Bowl, with Oregon going to the national title game. All of the major awards had their finalists announced on Wednesday. Former Texas Tech head coach sues ESPN. Former Texas Tech University head coach Mike Leach has announced that he is suing ESPN. Leach has filed the lawsuit amid charges that he mistreated receiver Adam James. Texas Tech fired Leach on December 30th after reports of mis treating Craig James’ son. Despite the firing, the Red Raiders beat Michigan State in the Alamo Bowl to finish the 2009 season. UCLA looking to extend coach’s contract. The UCLA Bruins receiver permission to extend offensive coordinator Norm Chow’s contract. Chow is working under head coach Rick Neuheisel, and out of 120 major college football teams, the Bruins offense ranks 111th in total offense. Chow has coached three Heisman award winners in his career as a collegiate coach. Chow’s future was being discussed throughout the season, including words from Neuheisel. Moeller declared sixth year of eligibility for the Buckeyes. Ohio State safety Tyler Moeller was granted a sixth year of eligibility by the NCAA on Wednesday. Moeller suffered a torn pectoral muscle early in the 2010 season, which followed a severe head injury during 2009. Moeller recorded 20 tackles, with 4.5 of them for loss during the season. He also forced two fumbles, caught an interception, and had a sack on the season. His Buckeyes are in the middle of a Big Ten title chase, and will play in Iowa City on Saturday against the Hawkeyes. Locker expected to play for Washington. Quarterback Jake Locker is expected to play on Thursday for the Washington Huskies. Locker hurt his ribs earlier in the season, and his season finale against the UCLA Bruins was in question. After Wednesday’s practice, the Huskies head coach Steve Sarkisian wrote on his twitter that “Jake Locker is cleared to play.”. The Huskies have had a rough season, winning just three of ten on the year. Arnaud’s career is over at Iowa State. Iowa State received bad news on Wednesday. The Cyclones found out their quarterback, and senior Austen Arnaud would miss Saturday’s game, and the rest of the season with a major knee injury. Arnaud injured his knee last week in a loss to Colorado. Doctor’s have said he will need a complete knee reconstruction. Arnaud finished his Iowa State career as the career leader in passing percentage, while ranking second in passing yards and passing touchdowns. Iowa State will host Missouri on Saturday. With a win, the Cyclones would be bowl eligible. Southern Miss shooting victim paralyzed. The Southern Mississippi football player who was shot, is paralyzed from the waist down. Head coach Larry Fedora announced after practice that linebacker Martez Smith also has a severed spinal cord. Also involved in the incident was Tim Green, who is unable to speak after being shot in the neck numerous times. The incident happened on Saturday night after the Golden Eagles beat Central Florida in Orlando. Southern Mississippi will host the Houston Cougars on Saturday in a Conference USA tilt. Man claims to have received Newton’s payment plan. A man who attended Mississippi State told the NCAA on Wednesday that he received a text message from a man who claimed to be Cam Newton’s agent. In the text message, it stated the payment plan that was offered to Newton and his father. This is the second person from the University to discuss payment plans between the University and Newton. As of now, no findings have been made as to Newton attending Auburn over Mississippi State. Notre Dame student dies filming practice. A Notre Dame student died on Wednesday after the tower he was filming Fighting Irish practice from fell over. The wind is to blame for the accident, as the gusts were up to 50 miles per hour in parts of South Bend. The Irish are preparing for a home game with the Tulsa Golden Hurricanes. Notre Dame will look to fare better then last week, when they were blown out at Navy. Oklahoma State suspends wide receiver. Oklahoma State Head Coach Mike Gundy announced Wednesday that wide receiver Justin Blackmon will be suspended one game for his part in a DUI charge. Blackmon will miss Saturday’s game against the Kansas State Wildcats. On the season, Blackmon has caught 62 passes for 1112 yards and 14 touchdowns. Last week, the 20 year old receiver caught 5 passes for 157 yards and 2 touchdowns. Rutgers unsure on starting quarterback for next game. Rutgers head coach Greg Schiano would not announce who his starting quarterback will be their next game; on November 3rd at South Florida. The Scarlet Knights are 4-3 overall and 1-2 in Big East play. The controversy is between freshman Chas Dodd and sophomore Tom Savage. The Scarlet Knights rank 109th in total offense, which may justify a controversy at the quarterback position. Dodd started in the wins over UConn and Army, but also looked poor in the loss Pittsburgh. Schiano expects to announce a decision by the end of the week. Nebraska suspends linebacker for battle against Missouri. With a huge game against the Missouri Tigers coming up, the Nebraska Cornhuskers found out Eric Martin would be suspended for the game. Martin made a helmet to helmet blow on an Oklahoma State player. While no penalty was assessed during the game, the conference has reviewed the play and found rule 9-6-3 which states: “if subsequent review of a game by conference reveals plays involving flagrant personal fouls that game officials did not call, the conference may impose sanctions prior to the next scheduled game.” The game between Nebraska and Missouri will most likely be for the winner of the Big 12 – North. Fresno State and Nevada will not move conferences until 2012. The Fresno State Bulldogs and Nevada Wolf Pack will remain in the Western Athletic Conference until July of 2012. At that time they will both join the Mountain West Conference. The Mountain West Conference will then just have eight teams in both football and men’s basketball for the 2011-2012 season, with Utah leaving for the Pac-Ten and Brigham Young heading into the league. At that time, Boise State will also join the conference. The WAC will receive $5 million from both Fresno State and Nevada for breaking an agreement by leaving the conference early. Rainey set to return for Gators. The Florida Gators are excited for the return of their running back/wide receiver Chris Rainey. Florida announced that Rainey is eligible to return October 30th when Florida takes on Georgia. Rainey was charged with aggravated stalking, which is a felony in the state of Texas. To be eligible and stay that way, Rainey has to agree and follow a set of guidelines given to him by the University. UConn’s quarterback suspended for remainder of season. The Connecticut Huskies took a big blow on Wednesday when they found out their quarterback Cody Endres would miss the remainder of the 2010 season. Endres had been suspended for a pattern of violations of the school’s substance abuse policy. The final straw for Endres has yet to be released by the University. Without Endres, a redshirt freshman Michael Box is expected to get the start on Saturday in a Big East game against Louisville. Alabama makes plans to start 2011 against Kent State. The Alabama Crimson Tide announced they will open the 2011 season against the Golden Flashes of Kent State. Alabama’s head coach Nick Saban played defensive back for the Golden Flashes during the 1970-1972 seasons. Hall of Fame linebacker Jack Lambert and current Missouri head coach Gary Pinkel also played during that time as well. This will be the first time the two teams have met in football. It will be the first game for Kent State against a SEC school since 2007 when they went to Kentucky. Michigan State and Miami set to battle each other in the future. Michigan State University and the University of Miami signed an agreement on Wednesday to play a home and away series in the next decade. The two teams will not meet until 2010 when the Hurricanes will come to East Lansing. Michigan State will return the favor the following season, heading to South Beach. The Spartans have also signed future contracts with West Virginia, Alabama and Notre Dame. Michigan State and Miami have played four teams; with the Hurricanes winning all of them. North Carolina continues to miss players. The frustrating and very disappointing 2010 season for the North Carolina Tar Heels continued on Wednesday when they found out they would be missing two more players. North Carolina’s Junior cornerback Charles Brown will miss the remainder of the season and Senior cornerback Kendrick Burney will sit out of Saturday’s game at Miami. The Tar Heels has seen six players miss the entirety of the season with NCAA investigations. Michigan State cornerback could see jail time. Michigan State Spartans cornerback Chris L. Rucker could be facing jail time after his off the court incident that occurred last weekend. Rucker was cited for driving while intoxicated on Sunday night in East Lansing. Michigan State head coach Mark Dantonio has already suspended the cornerback for one game. Rucker will miss the game at home against Illinois on Saturday. 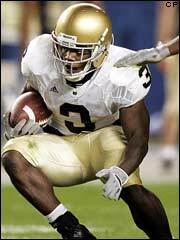 Rucker had an interception in the big rivalry win over the Michigan Wolverines on Sunday. The Spartans have started the season 6-0. Texas plans to retire McCoy’s number. The Texas Longhorns have plans to retire former quarterback Colt McCoy’s # 7 jersey on October 30th. This will be just the sixth jersey retired in the history of Texas football. McCoy was a Heisman finalist and won more games in his career than any other college football player (45). McCoy also leads the school in total touchdowns, touchdown passes and passing yards. McCoy was drafted by the Cleveland Browns, and is expected to make his first professional start on Sunday. South Carolina loses linebacker for the season. South Carolina Gamecocks linebacker Shaq Wilson will miss the remainder of the season. Wilson, who was the Gamecocks leading tackler in 2009 injured his hamstring in the preseason, and then re-aggravated the injury on September 25th against Auburn. Wilson hopes he will be granted a medical red shirt. Florida welcomes back Rainey to practice. The Florida Gators welcomed back receiver Chris Rainey on Wednesday. Rainey is getting a second chance with the team, after being suspended following an arrest on aggravated stalking charge. Rainey was the 30th player arrested for Urban Meyer in his sixth year at Florida. Rainey ran for 1,227 yards and nine touchdowns in his first two seasons as a Gator. Florida has lost two straight games, including last week in the final seconds to the LSU Tigers. Georgia suspends King for two games. The Georgia Bulldogs, who have gotten off to a very slow start this season announced Wednesday they were suspending running back Caleb King for two games after his behavior off the field. King was arrested, which brought the title amount of players in the Georgia program that has been arrested to 11. King will miss games against Kentucky and Vanderbilt. Washaun Ealey is expected to make the start for the Bulldogs. Dantonio expects to attend Saturday. The head coach of the Michigan State Spartans, Mark Dantonio plans to watch his team from the press box on Saturday. Dantonio, who suffered a heart attack after the win over Notre Dame has missed the last two games. He initially planned to attend the week five home game against Wisconsin, but the doctor advised him to stay at home. The game for the 17th ranked Spartans is against their long time rival – Michigan Wolverines, who come in ranked 18th in the latest poll. Meyer states Brantley ready to play. Florida head coach Urban Meyer announced that his quarterback John Brantley would be ready to play on Saturday when they take on the LSU Tigers. Brantley injured his ribs in a loss to Alabama. He finished the game with 202 passing yards, but also threw two interceptions. Brantley’s back-up is a true freshman; Trey Burton. Ohio State losses LB for the season. LB Tyler Moeller of the second ranked Ohio State Buckeyes found out he will miss the remainder of the season. Moeller felt a muscle in his chest tear away from the bone. He was fourth for the Buckeyes in tackles with 20. He missed the entire 2009 season due to have severe brain surgery. The injury came over the Big Ten opener for the Buckeyes; a win over Illinois. Ohio State is preparing to take on the Indiana Hoosiers home on Saturday. Miles College head coach Billy Joe has retired from his position as the head football coach. He has cited health concerns as his reasoning for retiring. He finishes his career with 243 wins in 33 seasons. That number is the second most to Eddie Robinson’s 408 among African American head coaches. 13 of those seasons came at Central State, and 11 at Florida A+M. Joe was inducted to the National Football Foundation College Hall of Fame in 2007, and was hired as Miles College Head Coach in 2008. LSU loses Montgomery for the season. The Louisiana State University football team received bad news on Tuesday evening. They found out starting defensive end Sam Montgomery will miss the remainder of the season with a torn ligament in his right knee. Les Miles, the Tigers head coach, stated Montgomery will prepare to be ready for the fall of 2011. Montgomery had 18 tackles on the season, with 6 coming for losses, and 2 sacks on the season. LSU prepares to take on the Gators of Florida on Saturday. UCLA releases three freshmen from team. The University of California-Los Angeles released three freshmen from their football team on Tuesday. Head Coach Rick Neuheisel announced that Paul Richardson, Shaquille Richardson and Josh Shirley would no longer be with the team. The three players were arrested last week on suspicion of stealing a purse, and also face felony theft charges. The three had enrolled in summer classes, have been dropped from the University, and will not be allowed to enroll in fall classes. USC asks for changes in penalties. The University of Southern California football team asked for some changes to the NCAA ruling on their illegal actions done by former head coach Pete Carroll and former running back Reggie Bush. The University asked for the two-year postseason to be reduced to one year. They also asked that the ten scholarship reduction for the 2011 through 2013 seasons be lowered to five. The University also imposed sanctions on their men’s basketball and women’s tennis teams. North Carolina freshman cited for misdemeanor. The University of North Carolina freshman defensive tackle Jared McAdoo was cited for a misdemeanor weapons charge. McAdoo, a native of Chapel Hill was pulled over on campus with a BB gun in his possession. It is a North Carolina state law to not have a firearm of any kind on a college campus. Back in the summer of 2008, McAdoo was cited for felony narcotics possession, before his senior season. McAdoo is expected to see a lot of playing time during the 2010 season. Florida State to retire Derrick Brooks’ jersey. The Florida State Seminoles football tam has decided to retire former linebacker Derrick Brooks’ jersey. Brooks was a two time All American for the Seminoles, along with a national title in 1993, and in the NFL went to the pro bowl 11 times, and also picked up a Super Bowl Championship in 2002.The University plans to have the ceremony for Brooks on November 13th, before the home game against Clemson. Brooks will be the 8th player in school history to have his jersey retired. Some of the others include Deion Sanders, Chris Weinke and Warrick Dunn. Ohio State recruit shot, in critical condition. Ohio State football recruit Jamel Turner is in critical condition after being shot multiple times early Saturday morning in Youngstown Ohio. The recruit played defensive end at Ursuline High School in Youngstown, and signed with the Buckeyes in February. Also involved in the shooting was a 17 year old female that has been declared dead. USC and Hawaii will still play opener. The University of Southern California and Hawaii Warriors season opening game on September 2nd at Aloha Stadium will still be played. After the Trojans were handed sanctions by the NCAA, the game was in doubt, because of the exemption from the current 12 game schedule. The game was scheduled in 2001, which was before the Trojans violations, which occurred in 2004. There is a Hawaii Exemption in the NCAA, which says visiting teams can play one more game than the NCAA maximum if playing in Hawaii. Pittsburgh open to joining Big Ten. The Pittsburgh Panthers officials have openly discussed their interest in joining the Big Ten. Originally after the Big Ten grabbed Nebraska, they were looking for the entry from Notre Dame. The Fighting Irish have declined to join, for now, so it appears the Big Ten will continue to search. The Panthers would be a natural fit with the Penn State Nittany Lions. Pittsburgh and Penn State have not played on the football field since 2000. Nebraska/Colorado disimbursement being worked out. With the Colorado Buffaloes and Nebraska Cornhuskers electing to leave the Big 12, they will both receive a penalty, which is 80 percent forfeiture of television revenue for two years. The teams are expected to receive their 2009-2010 revenue soon, as Nebraska’s original cut could have been up to $12 million, with their Big 12 title game appearance. After they receive the 2009-2010 payments, they are expected to receive no television revenue for next year. How the money that Colorado and Nebraska were supposed to receive gets split up is yet to be known. Utah accepts invite to Pac-Ten Conference. The Utah Utes have elected to be the 12th team within the Pac-Ten Conference. Sources say the Utes have accepted an invitation to join the conference, along with Colorado. Utah has been a member of the Mountain West Conference since 1999. The addition of Utah is said to have given Colorado a geographical rival and also a travel partner. The conference is expected to go to two six team divisions. Ohio State’s Moeller cleared to play. The Ohio State University’s safety Tyler Moeller has been cleared to play during the 2010 football season. Moeller was unable to play during the entire 2009 season, while he recovered from brain surgery, after being assaulted at a bar in Florida. Moeller was a reserve linebacker for the Buckeyes during the 2006 – 2008 seasons. In 2008, he completed 18 tackles, and was expected to be a starter on the 2009 squad. In 2010, Moeller is expected to play safety. He may be allowed to play an additional season due to his situation. The Arkansas Razorbacks have said they have no intentions on joining the Big-Ten Conference. After Nebraska elected to join the conference, along with several other teams moving conferences, the speculation was that the Razorbacks would be the next team to move. School athletic director Jeff Long stated that they have no interest. Arkansas played in the Southwest Conference until the 1991 season, when they joined the SEC. Reggie Bush vows to help the USC Football program. One of the University of Southern California’s top running backs stated on Wednesday that he will help fight for the University over the recent sanctions handed to them by the NCAA. The NCAA stated that Bush and his family received improper benefits from marketing agents that worked for the University. The penalty came down recently, and it came down hard. The University was banned from bowl games for two seasons and also stripped of 30 scholarships. The NCAA also ruled that the Trojans would have to vacate wins from the 2004 and 2005 seasons, including their national title over Oklahoma in 2005. Bush is currently playing for the New Orleans Saints, and enjoying the off-season after winning the 2010 Super Bowl. The quarterback of the 2009 Oregon Ducks football team entered a not guilty plea on Tuesday in an Oregon courthouse. Masoli was cited on June 7th for possession marijuana, driving with a suspended license and failing to stop when entering a roadway. This came after Masoli pleaded guilty to theft in an Oregon frat house back in January. After the first incident, Masoli was suspended for the entire 2010 season by head coach Chip Kelly. After the most recent incident, Masoli was kicked off the team, and he has apparently dropped from the University. Houston star quarterback to return next season. The Houston Cougars got good news Wednesday, when they head their star quarterback Case Keenum would return for his senior season. Keenum has elected to not enter the NFL draft, after leading the Cougars to a Conference USA championship. Keenum is one of two college quarterbacks in history to throw for more than 5,000 yards in each of his two seasons. Tennessee wants to hire new coach by end of weekend. The Tennessee Volunteers will look to have their coaching search completed by the end of the weekend, according to Athletic Director Mike Hamilton. Lane Kiffin announced late Tuesday night he was leaving the University, to head to USC. Currently Kippy Brown is taking over on an interim basis, as the head coach. Brown was hired in 2008 when Kiffin started in Knoxville. Texas Tech hires offensive coordinator. The Texas Tech Red Raiders announced the hiring of an offensive coordinator Wednesday. New head coach Tommy Tuberville elected to hire Troy’s Neal Brown as the new coordinator. Tuberville expects Brown to continue running the spread offense. Brown, who is just 29 years old, spent four seasons at Troy, including the last two as the offensive coordinator and quarterback coach. John Goodman could become Irish quarterback. Brian Kelly, the new head coach at Notre Dame has mentioned, wide receiver John Goodman could move to quarterback, starting this spring. Dayne Crist continues to rehabilitate his torn ACL, along with freshman Tommy Rees and walk-on Nate Montana having the only other experience behind center. The Irish finished 6-6 last year, forcing the University to fire head coach Charlie Weis. Patterson named AFCA Coach of the Year. The American Football Coaches Association named Gary Patterson their 2009 Coach of the Year. Patterson led the Texas Christian University Horned Frogs to a 12-1 record, and a BCS appearance for the first time in school history. TCU beat three teams from within the Top 25, Brigham Young, Utah and Clemson. TCU, along with Florida were ranked in the Top Ten in the country in both total offense and total defense. Alabama/Texas set to kick-off for title. Two storied programs in college football will meet up on Thursday night in the National Championship Game. The Alabama Crimson Tide and Texas Longhorns will meet in Pasadena California. The Longhorns are seeking their second BCS title in five years. Texas beat USC in 2005 behind Vince Young’s heroics. Alabama is looking for their first title since 1992. The game will feature two stars that both sat in New York City during the Heisman Award ceremony; Mark Ingram and Colt McCoy. Ingram came away with the award, rushing for over 1500 yards and 15 touchdowns. Iowa wraps up Orange Bowl title. The Iowa Hawkeyes finished off a solid bowl season for the Big Ten, winning the Orange Bowl over the George Tech Yellow Jackets. The Hawkeyes jumped out to a 14-0 lead early and never looked back. Iowa was led by 231 passing yards from quarterback Ricky Stanzi. Stanzi missed the two games Iowa lost during the regular season. Georgia Tech quarterback Josh Nesbitt only passed the ball nine times in the loss; completing just two passes. Johnathan Dwyer was also held to just 49 rushing yards for the Yellow Jackets. The Big Ten ended the bowl season with four wins and three losses. Florida State announces Fisher as new head coach. With big shoes to fill, the Florida State Seminoles announced Jimbo Fisher as their new head football coach. Fisher will take over for Bobby Bowden as the head man. Fisher, who is 44 years old, will make his head coaching debut on September 4th, 2010 against Samford. The Seminoles then take on Oklahoma, in Norman, and host Brigham Young; all in non conference play. Fisher, before his time at Florida State, spent time at LSU and Cincinnati, along with Auburn. Phillips introduced as new head coach at Kentucky. Taking over for veteran coach Rich Brooks, Joker Phillips was announced as the new head football coach at the University of Kentucky. Phillips was the offensive coordinator at Kentucky before taking the head coaching position. Phillips is the first black head coach in Kentucky history, and just the second in the Southeastern Conference. Phillips grew up in Franklin Kentucky, and has spent time coaching at Cincinnati, Minnesota, Notre Dame and South Carolina. McClain appears to be ready for Alabama in national title game. Nick Saban, head coach of the Alabama Crimson Tide, announced junior linebacker Rolando McClain will be ready to play in the national title game Thursday night. McClain was struck by a stomach bug on Tuesday, along with Rod Woodson. Florida Governor endorses Bowden back as coach of Seminoles. Florida Governor Charlie Crist has endorsed Florida State Seminoles head coach Bobby Bowden, and says he deserves respect to remain on the sidelines. Bowden, who is 80 years old, has been hearing talks about the school looking to force him out after this season. Bowden has said he would like to coach one more season, before turning it over to assistant Jimbo Fisher. Bowden is second all-time in wins, with 387. McCoy looking to set record for wins. Texas Longhorns quarterback Colt McCoy is in search of becoming the career leading in wins by a quarterback, Saturday when they face the Kansas Jay Hawks. With a Longhorns win, McCoy would pass Georgia’s David Greene, with 42 career wins. McCoy is 42-7 in his career as the Longhorns quarterback. The Longhorns are looking to stay unbeaten, and continue on their crash course with the SEC winner for the national championship, in January. Arizona prepares to slow down Oregon. The Arizona Wildcats have been hard at work, in an effort to slow down the Oregon Ducks this Saturday. Arizona, coming off the loss to California is looking to tie the Ducks in losses within the Pac-Ten Standings. Stanford and Oregon State, also have two losses, so a Wildcat win, would make things very interesting. Last season, the Wildcats allowed Oregon to score 55 points; with 45 of them coming in the first half. Harris expected to play Saturday for Miami. Miami Hurricanes quarterback Jacory Harris is expected to play Saturday in their game against Duke. Harris came away with an injury after the Hurricanes win over Duke last week. Head Coach Randy Shannon said he “has been limited all week, but has been using a protective sleeve”. Shannon then when on to say there “no chance” Harris would not be available. Brandon Minor doubtful against Ohio State. Michigan running back Brandon Minor is doubtful for Saturday’s game with Ohio State, according to Wolverines head coach Rich Rodriguez. Minor has been battling a lower leg injury all season, but hurt his shoulder in the Purdue game. The senior was hoping to play in his last home game at the Big House, but now that appears unlikely. Hurricanes look for first ever win in Chapel Hill. Randy Shannon and the Miami Hurricanes are seeking their first ever win in Chapel Hill, over the North Carolina Tar Heels. The statistic seems like a mis-print, with North Carolina traditionally a basketball power, and Miami a football power. Both schools have won five national titles in the sport. The Hurricanes are also looking for a Duke win over Georgia Tech to keep their Atlantic Coast title hopes alive. Cincinnati set to start Callaros, expect Pike to play. Cincinnati head coach Brian Kelly stated on Tuesday night that he was starting Zach Callaros behind center on Friday night against West Virginia. He also said starting quarterback Tony Pike would try to be fit into certain offensive packages against the Mountaineers. The Bearcats are 9-0, and on the outside looking in, at a BCS title. Cincinnati is also looking at winning a Big East title, with this game against West Virginia, and then a road game at Pittsburgh to finish the season. Callaros threw for 480 yards - the second highest in school history in the two point win over Connecticut. Iowa quarterback doubtful for next two games. Iowa quarterback Ricky Stanzi has been listed as doubtful for the teams final two regular season games. Iowa head coach Kirk Ferentz said Stanzi had to have surgery to repair a severely sprained ankle. Stanzi hurt the ankle in the second quarter of the Hawkeyes loss to Northwestern. Ferentz says red shirt freshman James Vandenberg will make his first career start in a key Big Ten game against Ohio State. South Florida looking for revenge over Rutgers. The South Florida Bulls are looking to snap a streak of three losses in a row to the Rutgers Scarlet Knights. Last year, Rutgers blasted the Bulls 49-16, on their way to a seven game winning streak to finish the season. South Florida felt Rutgers head coach Greg Schiano may have ran up the score in the affair. South Florida looks to even the score, as a pair of 6-2 teams kick-off on Thursday evening. Ohio State has mind set on 2010 Rose Bowl. For a team that has dominated the Big Ten, like Ohio State has done, the Ohio State Buckeyes have not played in the Rose Bowl since 1997. With the new BCS system, teams like Oklahoma and Texas have played in the Rose Bowl more than the Buckeyes in the last ten years. With a win over Iowa on Saturday, Ohio State will be returning to Pasadena. The last time Ohio State played in the Rose Bowl, they beat Arizona State 20-17. USC’s Johnson leaves the hospital. 16 days after a weight room injury that could have killed Trojans running back Stafon Johnson, he was able to walk out of the hospital on Wednesday. Johnson underwent several hours of surgery to repair his throat. USC head coach Pete Carroll says Johnson may be granted a medical red shirt which would allow him a sixth season. But before that, Johnson and his family is concerned about his health. Michigan quarterback Tate Forcier’s status is unknown. After sustaining a concussion on Saturday against Iowa, Michigan quarterback Tate Forcier may be forced to miss this week’s action against Delaware State. Head Coach Rich Rodriguez said he would not allow Forcier to play unless he was certain the medical staff had cleared him. The injury for Forcier is very similar to that of Florida quarterback Tim Tebow. Cincinnati/South Florida set to battle in key Big East tilt. The Cincinnati Bearcats and the South Florida Bulls will both bring their 5-0 records to the field on Thursday evening. Cincinnati is ranked 8th in the nation, while South Florida sits at # 21. The Bulls are expecting a full house in front of the national audience, on ESPN. The Bearcats are the defending Big East Champions, and look to repeat this season. The winner of this game would certainly give that team a heads up in conference play. New Mexico gives Locksley ten day suspension. New Mexico head coach Mike Locksley will not be on the sidelines for Saturday’s game with UNLV. Locksley has been suspended by the University after his altercation with former assistant J.B Gerald. Defensive backs coach George Barlow will serve as interim coach in the game. The suspension for Locksley will not just be Saturday’s game, it will also include nine days leading up to the game. Locksley will lose pay during that time as well. New Mexico has yet to win in 2009. Miami will be missing key defensive player on Saturday. The Miami Hurricanes will take on Central Florida on Saturday night without both defensive end Eric Moncur and safety Randy Phillips. Moncur will be sidelined with a lower leg injury, while Phillips will miss due to an arm injury. Defensive linemen Josh Holmes and Marcus Forston have also been hurting for Miami. The Hurricanes were forced to use Curtis Porter last week. Porter was a player in which the Hurricanes were considering for red shirt candidacy. Meyer states Tebow looks “terrific”. University of Florida head football coach Urban Meyer stated Wednesday that his quarterback Tim Tebow looks terrific. The Gators, who are ranked # 1 in the nation lost Tebow in the first half of their game against Kentucky when he was hit hard, and suffered a concussion. Florida has a bye this week, and it is still unknown whether Tebow will be ready for the Gators next game on October 10th. University of Southern California running back Stefon Johnson was able to communicate non-verbally on Wednesday after a freak accident in the weight room that could have killed him. The bar slipped from his right hand and crushed his neck and larynx, which required seven hours of surgery. Doctors state one of the main reasons Johnson was able to survive the accident was his muscular neck. It’s unclear whether Johnson will be able to speak again. Big East – Big 12 to meet at Yankee Stadium. The Big East and the Big 12 will meet up in the new Yankee Stadium starting in December of 2010. The conferences and the New York Yankees agreed to a four year agreement. In the bowl game, the Big East will send its third or fourth selection, while the Big 12 will send their 7th selection. If the Big 12 does not have enough bowl eligible teams, Notre Dame has agreed to play in the game. Wyoming coach has surgery to remove kidney stones. Wyoming coach Dave Christensen underwent surgery on Tuesday to remove a kidney stone. Christensen will not travel with the team when they head to Florida Atlantic this weekend. Christensen, who is in his first year as the head coach at Wyoming went to the hospital Tuesday after not feeling well. Clausen does not expect to be 100 percent. Notre Dame quarterback Jimmy Clausen does not expect to be 100 percent when he takes the field Saturday against Washington. Coach Weis has stated he does not expect Clausen to be 100% for any future game in 2009. Clausen has been battling an injury to his right big toe. Clausen played with the injury on Saturday against Purdue, throwing for 171 yards and a touchdown. Irish’ Clausen may miss action with turf toe. Notre Dame quarterback Jimmy Clausen is questionable for Saturday’s game against Purdue. If Clausen does play, it will be with an injured right big toe. Clausen will also be without his top receiver, who has caught 27.5 yards per catch and more than a touchdown per game. Clausen will hope to play with a shoe insert that will help him deal with the injury. Michael Floyd, the receiver will miss time due to a broken left collarbone. Penn State LB may miss action. Penn State Nittany Lions Sean Lee hopes to return for Saturday’s game with Iowa. The team and the standout linebacker is unsure on his status. The left knee of Lee felt a little better early in the week, but team doctors are looking for near 100% before return. Lee missed the entire 2008 season with a right knee injury. Purdue guard Reckman suspended for Notre Dame game. The Big Ten suspended Purdue’s Zach Reckman for Saturday’s game with Notre Dame. Reckman put a late hit on a Northern Illinois player towards the end of the loss on Saturday. Reckman dropped a right forearm on NIU’s Sean Progar. Purdue head coach Danny Hope said in a statement that Reckman made a mistake, but the team would have to live with the Big Ten’s decision. Injuries mount as Hawkeyes prepare for Penn State. The Iowa Hawkeyes are preparing for the Big Ten leader Penn State Nittany Lions on Saturday. A year after upsetting the Nittany Lions at home in 2008, the Hawkeyes will have to play as well, or better in 2009 to repeat that. Head coach Kirk Frentz is now trying to figure out who will be playing for his Hawkeyes come Saturday. First, Jewel Hampton went down with a season ending knee injury, then Bryan Bulaga came down with an illness, and most recently wide receiver Derrell Johnson-Koulianos and tight end Tony Moeaki went down with leg injuries. Hampton will not play Saturday, while the rest of the players’ status are unknown for Saturday. Akron suspends quarterback and coach. Akron quarterback Chris Jacquemain has been removed from the team for the remainder of the 2009 season. The Zips quarterback violated team policy and missed the game against Indiana. Jacquemain apologized in a statement for his actions. The quarterback will remain on scholarship and remain in school. Akron also suspended assistant football coach Reno Ferri and will be suspended pending an internal review by the NCAA compliance committee. USC quarterback Barkley could sit out Sunday’s game. heralded freshman quarterback Matt Barkley may sit out of USC’s tilt with Washington on Saturday. Barkley was unable to throw in practice on Wednesday due to a bone bruise in his right shoulder. Barkley played hurt in the second half of the Trojans 18-15 win over Ohio State on Saturday. Despite being hurt, Barkley still led USC to late touchdown that went 86 yards. Sophomore Aaron Corp has been working with the first string offense in practices this week. Corp and Barkley battled for the position through the entire spring and summer with Barkley edging him out. Nebraska running back leaves program. Nebraska head coach Bo Pelini has announced that red shirt freshman Collins Okafor has left the football program. Pelini states Okafor did not leave for disciplinary reasons. Okafor, who is 6’1, 225lbs was expected to be able to play this fall for the Cornhuskers. This is the second Nebraska running back to leave the program this season. Quentin Castille was dismisses from the team in August for violating team rules. Fighting Irish look to snap six game losing streak to Michigan State. Charlie Weis and the Notre Dame Fighting Irish are looking to snap a six game losing streak to Michigan State on Saturday. The Irish are coming off a defeat at the hands of the Michigan Wolverines last Saturday, and the Spartans are reeling after their upset loss to Central Michigan. The Irish have had some sickness going around their football team, but it appears Armando Allen, their running back is 100%, while wide receiver Michael Floyd is ready to go. Some say this is the biggest game of Weis’ Fighting Irish tenure. Georgia Tech/Miami set to tangle in Atlantic Coast Conference tilt. The Yellow Jackets of Georgia Tech and the Hurricanes of Miami will square off on Thursday evening in a key Atlantic Coast Conference affair. The Yellow Jackets are coming off a win over Clemson, while the Hurricanes have the win over Florida State under their belts. Georgia Tech has won the last four meetings between the two teams. Tebow, Gators not worried about Vols’ trash talk. Tim Tebow and the Florida Gators are not phased by the trash talk of the new Tennessee coach Lane Kiffin. Kiffin exclaimed his team would be signing “Rocky Top” after beating the Gators this season. Along with those comments Kiffin has made comments regarding Tebow and also his head coach Urban Meyer. Tebow insists he is not focused on the talk but is preparing for a repeat of the 2008 national champions. Brigham Young jumps 11 spots in the Associated Press poll. The Brigham Young Cougars made an 11 team jump in the Associated Press poll released on Tuesday. BYU pulled the biggest upset of the first week of the season by knocking off Oklahoma 14-13 in Norman. The Cougars moved up from their initial position at # 20, to # 9. Florida continued to hold the top spot, followed by Texas, and USC. Florida Wide Receiver out for the season. Florida Wide Receiver Andre DeBose will have season ending surgery to repair a torn hamstring. Urban Meyer touted DeBose as the prized recruit coming into the season. The 5’11, 185 speed demon was expected to replace Percy Harvin. Doctors initially thought the injury was just a pulled muscle, but later tests revealed a partial tear. Washington State cancels 2011 Hawaii Game. Washington State has elected to cancel a 2011 game at Hawaii. The Cougars will pay a $300,000 fine for canceling the game. Washington State claims uncertain changes in the Pac-10 schedule has caused the cancellation. Michigan State did the same thing in 2007 and were forced to pat $250,000. Cincinnati blasts Rutgers to kick-off Big East season. The Cincinnati Bearcats picked up right where they left off in 2008, when they reached their first ever BCS bowl game. The Bearcats jumped out to a 31-7 lead at halftime over Rutgers, and continued the beating in the second half, out scoring the Scarlet Knights 16-8. Tony Pike lead Cincinnati with 362 passing yards and three touchdowns. Mississippi runs over Memphis in season opener. The Ole Miss Rebels made easy work of the Memphis Tigers on Monday evening. Ole Miss got off to a 17-7 halftime lead, only to outscore Memphis 28-7 in the fourth quarter and walk away with a 45-14 win. The Rebels gained 349 total yards on offense, and forced Memphis to turn the ball over three times in the win. Trojans look to continue at the top of the Pac-10. As much as the Pac-Ten conference will be changed in 2009, one thing has remained the same - the USC Trojans are the team to beat in 2009. At the conference’s annual media day, the entire cast of coaches opposing the Trojans discussed USC as the “team to beat”. USC has won seven straight Pac-Ten titles and also competed in a BCS bowl game all seven years. The Trojans have also finished in the fop four of the AP poll seven straight years. USC will come into the season with an untested quarterback - most likely Aaron Corp, and will also sport new starters in their defense. Hawaii head coach McMackin suspended 30 days. Hawaii’s head football coach Greg McMackin was suspended 30 days without pay, and has offered to take a 7 percent pay cut from his salary after making derogatory remarks regarding a Notre Dame chant during last year’s Hawaii Bowl. In total McMackin will lose close to $169,000 from this years salary. Hawaii’s athletic director Jim Donovan has stated that McMackin will remain with the team on a voluntary basis for the 30 days, and has recognized the slur was a huge mistake. McMackin, in his second season at Hawaii used a slur that targeted gays to describe the chant. Conference USA and the Hawaii Bowl agree to deal through 2013. Conference USA has agreed to play in the Hawaii Bowl through the 2013 season. This years game will take play on December 24th, 2009 and will feature a Conference USA team against a Western Athletic Conference opponent. The last time a Conference USA team played in the Hawaii Bowl was 2007 when East Carolina beat Boise State. Last year Notre Dame beat Hawaii 49-21in the game. Terry Bowden back into coaching. Terry Bowden, the former head coach at Auburn has emerged back into NCAA coaching. Bowden is preparing for his first season as the head coach at Division II North Alabama. Bowden, who won his first 20 games as a head football coach left Auburn 11 seasons ago abruptly. Bowden has been a radio host, and an ABC studio analyst the past several seasons. Pacific hires Buckley as new head coach. Keith Buckley, a former University of California-Davis assistant has been hired as the new football coach at Pacific University. Pacific has not fielded a NCAA football team since 1991, but are expected to start back up in 2010. Buckley spent four seasons at UC Davis, which he also played at. Buckley has also coached at Humboldt State and Idaho.